NEPTUNE – “You could actually feel the excitement in the air,” exclaimed GNJ Lay leader Rosa Williams. “All of the laity were eager, excited, and engaged in learning with delightful energy and a spirit of hope.” The Mission and Resource Center was packed and bustling with laity from across GNJ participating in the day long 2017 Laity Leadership Academy on September 9. 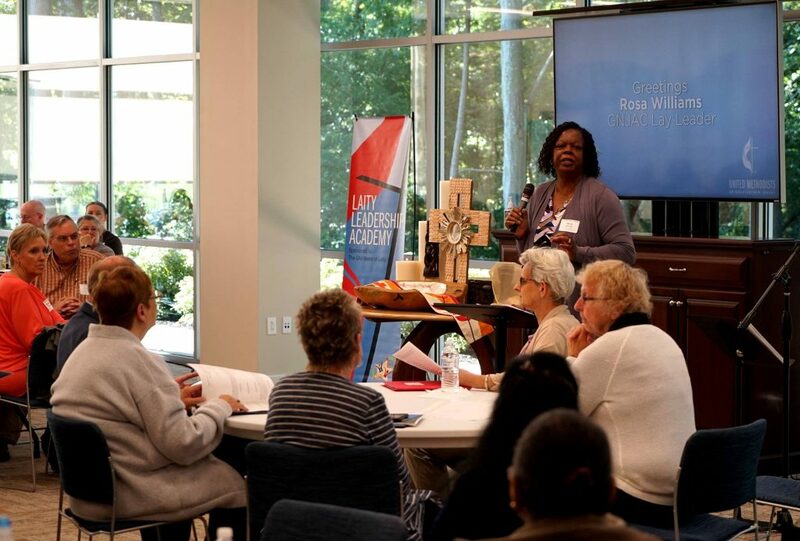 Designed to provide the tools and skills required for lay leaders to empower their churches for the challenges of the 21st century, the academy featured six different tracks with action plans for laity to bring back to their congregations. The evangelism track focused on ways their churches could seek out local issues and meet with community leaders to link the church with the community. They discussed marketing their church and actively making connections with people outside their church. Eric Drew, Director of Worship, led a track called “I’m with the band” focused particularly on leading worship. With members of worship bands from throughout GNJ coming to engage in learning and dialogue, the group also had a chance to jam together. “We learned a lot from each other about challenges in our churches as well as things that are working well,” said Drew, who was especially excited to have Rev. Charles Perez of Morristown UMC come with a student from his church’s Holy Hoops Ministry. In the group’s time of worship band coaching they incorporated freestyle Christian rap. “That was pretty fun,” said Drew. Arthur Harrell and Helen Hunter, who both have a healthcare background, led a track about vital ministries with older adults due to the amount of congregants in GNJ who are aging and have family members responsible for taking care of them. Harrell and Hunter hope to set up a model program within the Raritan Valley District where they reside, to act as a springboard resource for others in GNJ to do something similar. Eric Valosin’s track on creating a church website was particularly innovative for those in attendance. The group discussed emerging trends in web design, tips from the United Methodist branding manual, the tools needed to host a website and a hands-on website building tutorial; working together to build a page for a hypothetical church website. Participants sketched out on paper the pages age of the website they wished to build and gave a short presentation of each page, explaining their reasoning behind their decisions for the group to critique. Other tracks included an expressive liturgical and praise dance workshop led by Pamela D. Gordy, and building an effective church social media strategy, facilitated by Debbie Bruce, George Lagos, and Eric Lottes. Speakers from Raptor Marketing Group and Blue Vista Solutions educated the group in the many areas of defining church core values, determining target audiences, selecting the right social channels, and creating professionally branded imagery.